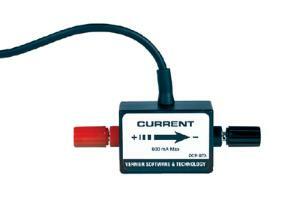 Use the Current Probe to measure currents in low-voltage AC and DC circuits. With a range of ±0.6 A, this system is ideal for use in most "battery and bulb" circuits. Use it with the Differential Voltage Probe to explore Ohm’s law, phase relationships in reactive components, and much more. Use multiple sensors to explore series and parallel circuits. It can also be used in electrochemistry experiments.